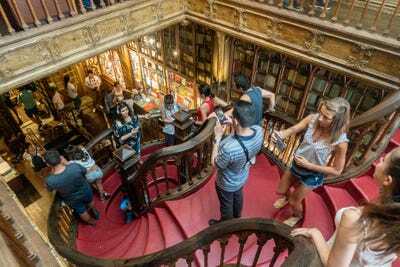 ShutterstockPrepare to step into Hogwarts at the Livraria Lello bookstore in Porto, Portugal. The Livraria Lello bookstore in Porto is one of the world’s oldest bookstores, frequently ranked as one of the most beautiful bookstores in the world, and a top place to visit in Portugal. 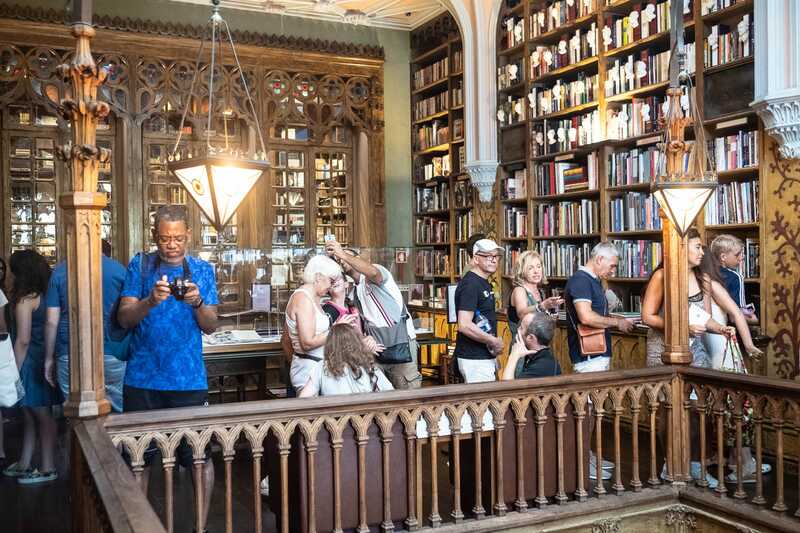 Opened in 1906, the bookstore was once a haunt of the city’s literary scene, and many say it was a direct inspiration for J.K. Rowling and her Harry Potter books. Rowling lived in the city from 1991 to 1993 and was a frequent customer. Today, the bookstore sees 4,000 to 5,000 visitors a day, which can make the cramped bookstore feel like a tourist trap. Despite the crowds, I still enjoyed my visit. 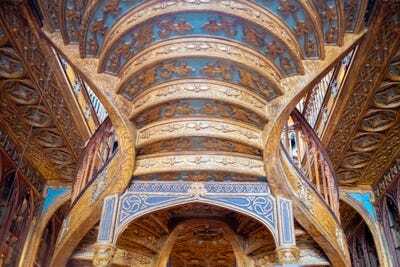 The Livraria Lello bookstore in Porto, Portugal, is one of the world’s oldest bookstores and frequently ranked as one of the most beautiful bookstores in the world. 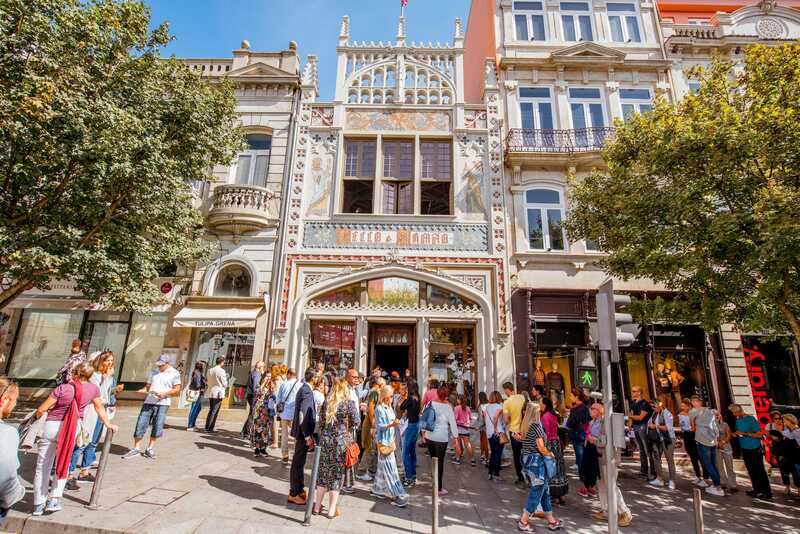 An age-old coastal city in northwestern Portugal with cobblestone streets and a historic medieval center, Porto is one of the country’s premier tourism destinations. And Livraria Lello is one of the top attractions in the city. Opened in 1906 by the brothers José and António Lello on Rua das Carmelitas, the bookstore is a stunning architectural landmark and was once a frequent hangout for Portugal’s literary scene. 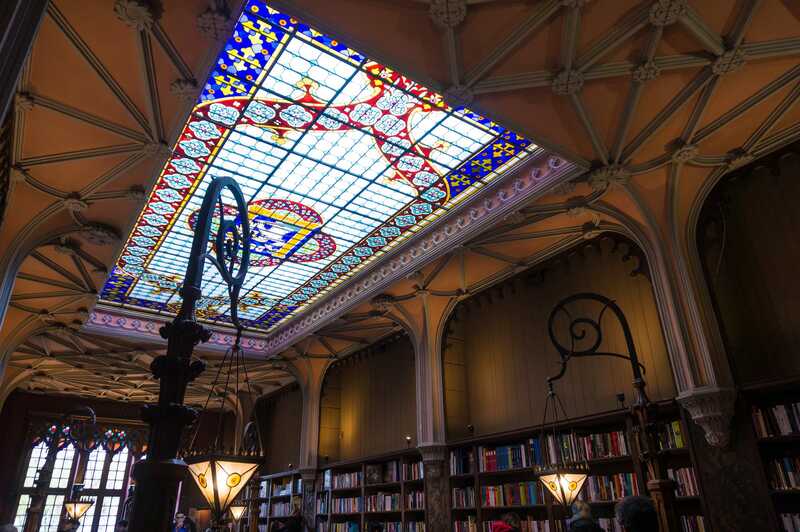 The neo-Gothic building features a stained-glass ceiling, gorgeous wood carvings, ladders, and rails to move the books around, and a special room to protect the bookstore’s oldest and rarest books. If all this sounds like a scene from a “Harry Potter” story, you’d be forgiven for thinking so. J.K. Rowling lived and taught English in Porto from 1991 to 1993 and was a loyal customer of Livraria Lello at the time. 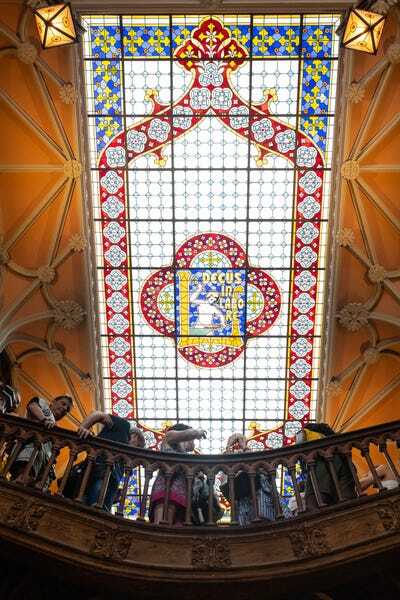 Many have suggested that the bookstore’s ornate neo-Gothic architecture bears a striking resemblance to depictions of both Hogwarts School of Witchcraft and Wizardry, the central setting of the books, and the Flourish and Blotts bookshop, where characters in the books purchase their books on magic. 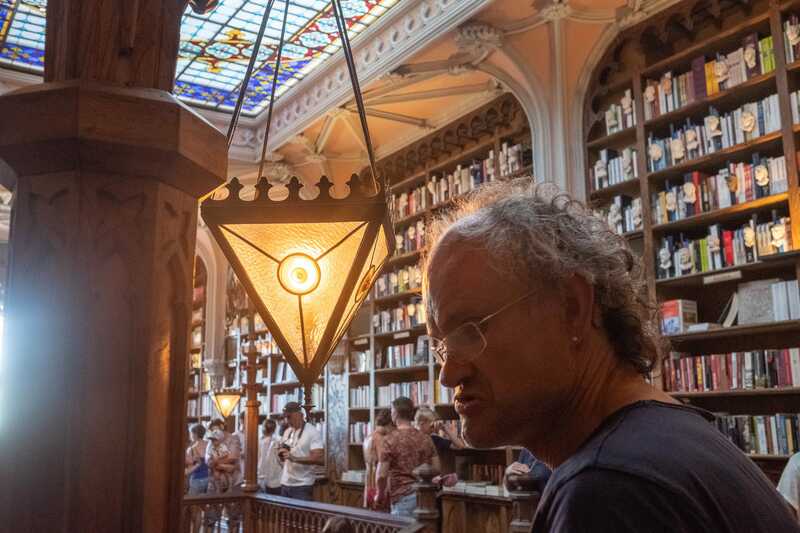 As a writer and someone of the age for whom Harry Potter was a formative cultural experience, I knew upon arriving in Porto that a pilgrimage to Livraria Lello was a necessity. 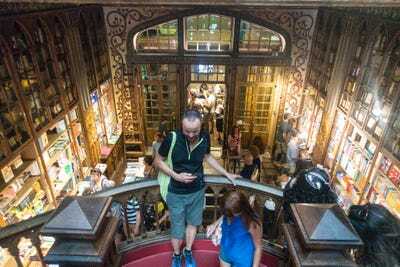 I had heard it best to head to Livraria Lello as early as possible because it gets crowded. I thought I was doing OK when I got there at 11 a.m. (it opens at 10 a.m.), but when I saw the line that stretched down several blocks, I knew I was in trouble. 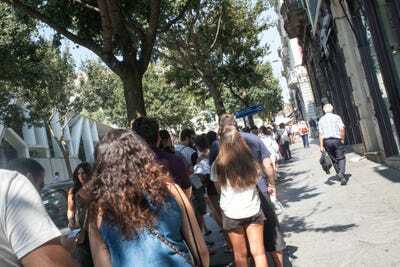 To get in, you have to buy tickets for 5 euros a pop (applicable toward a book purchase) from a separate storefront. 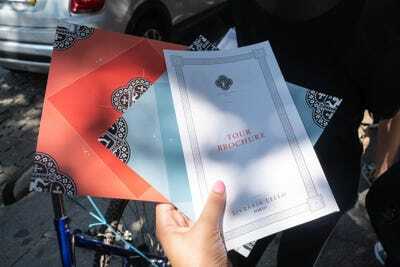 My girlfriend, Annie, went and got the tickets while I held our place in line. There were some nice brochures to browse through. The line was scalding in the summer sun, but, thankfully, Livraria Lello employees were handing out umbrellas to shade people from the sun. 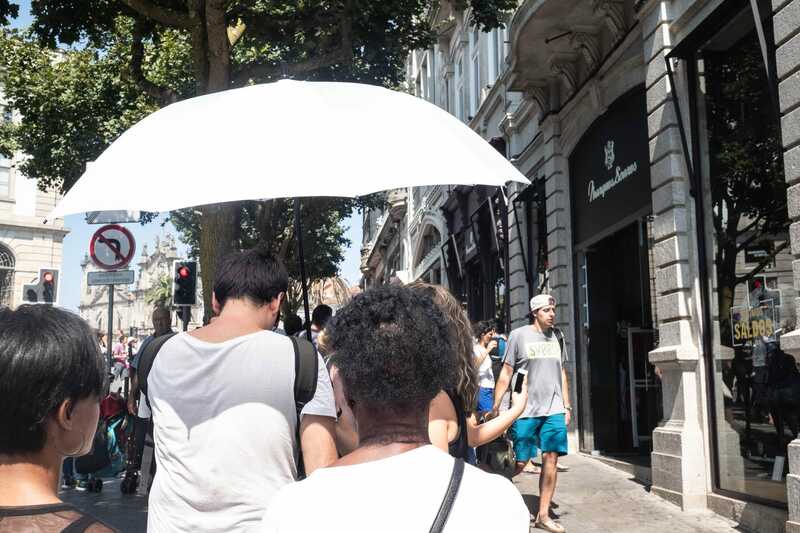 It was a nice gesture when you are feeling like tourist cattle. Opened in 1906 — though there were a few predecessors dating to 1869 — the bookstore was designed by the engineer Francisco Xavier Esteves. 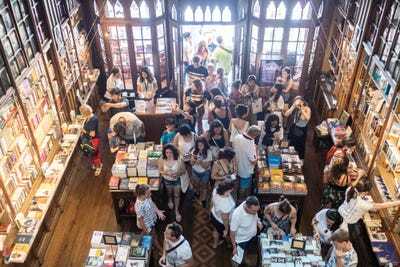 The bookstore was long a popular haunt for writers and readers in Porto, but more recently it suffered serious financial problems. Despite the mass of people visiting the store every day — up to 5,000 as of last year — no one was buying books. People just wanted to see the architecture. 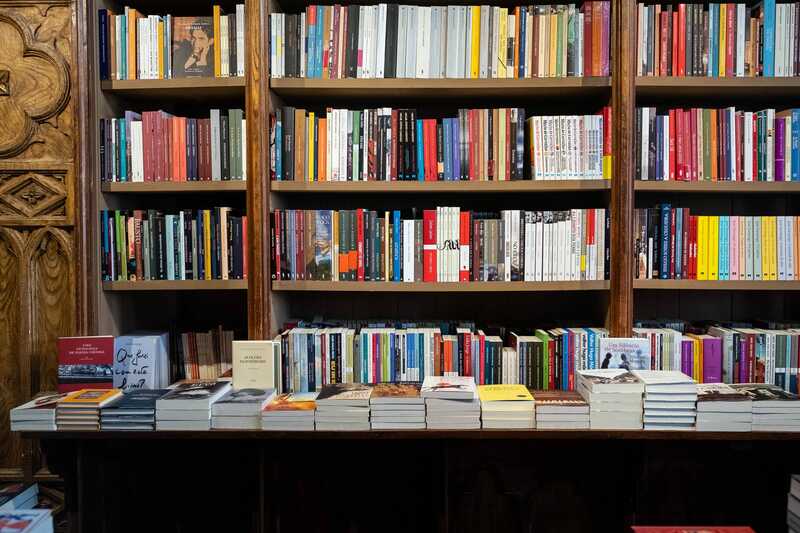 So, in 2015, the bookstore started charging entrance fees. The fees did nothing to discourage tourists. The store had 1.2 million visitors and $US8.14 million in revenue last year, according to Der Spiegel. On the August day I visited, this is what it looked like when I entered the store. 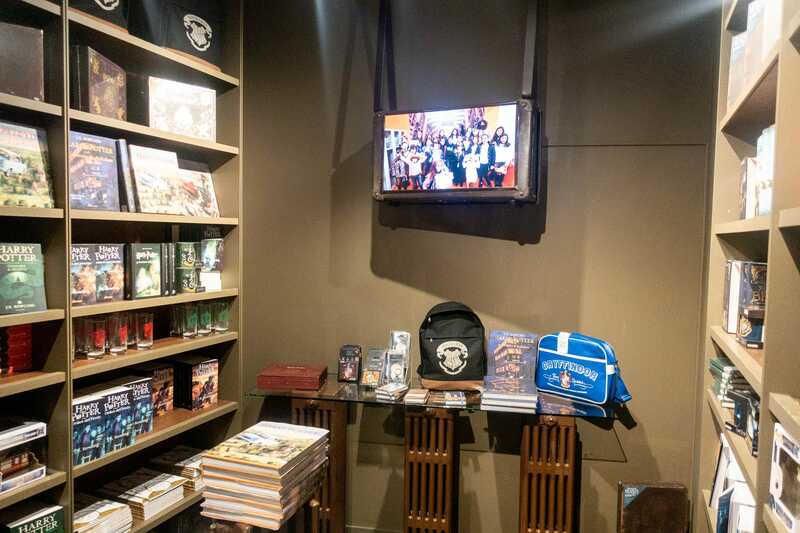 Most people who decide to visit (including me) have probably seen this view of the bookstore online. During the summer months, it is never this empty. The store’s centrepiece — a forked spiral staircase with wood balusters — is still a showstopper. But truthfully, it’s hard to enjoy much of anything when there are hundreds of tourists pushing past you to also take photos of everything or to get selfies. Look up and you will still be transported. 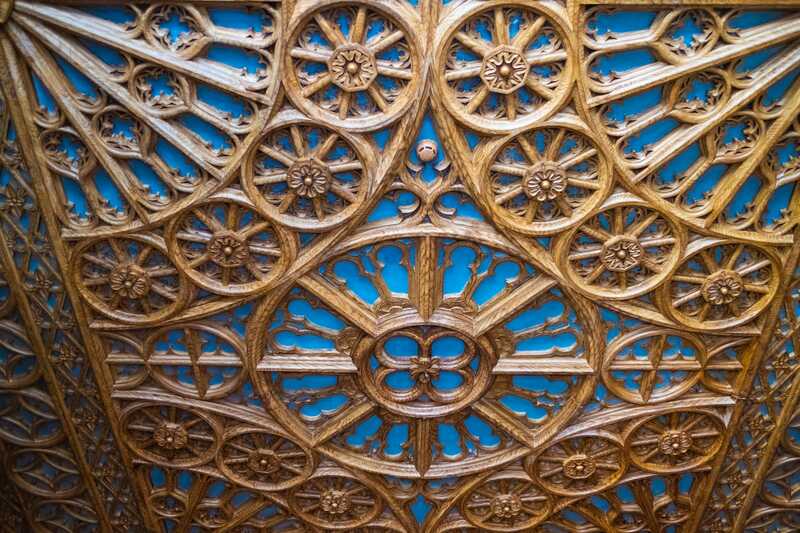 The ornate ceiling is decorated with painted plaster, made to mimic sculpted wood. While most people don’t exactly visit the bookstore to buy books, there is an extensive and interesting selection of tomes to choose from. I ended up buying an English translation of “Blindness” by the Portuguese master and Nobel Prize winner José Saramago. 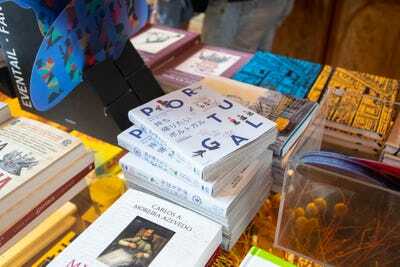 There were books in languages ranging from French to Japanese to English. I can’t imagine it’s easy to find an enticing mix of books catering to the bookstore’s almost exclusively tourist clientele. The bookstore is much too packed at this point for Portuguese to bother with, I would think. If you can push past the tourists to the back of the first floor, you’ll find the Harry Potter room, filled with books and memorabilia. 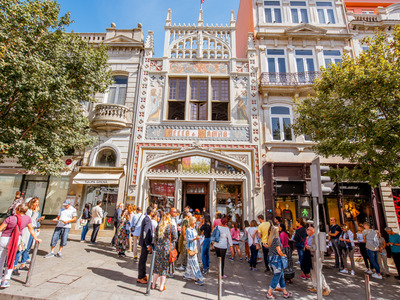 It has been reported repeatedly that J.K. Rowling, who lived and taught English in Porto, was a loyal customer of Livraria Lello. 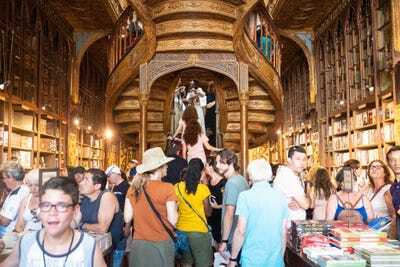 Many have suggested that the bookstore bears a striking resemblance to depictions of Hogwarts School of Witchcraft and Wizardry, the central setting of the books. 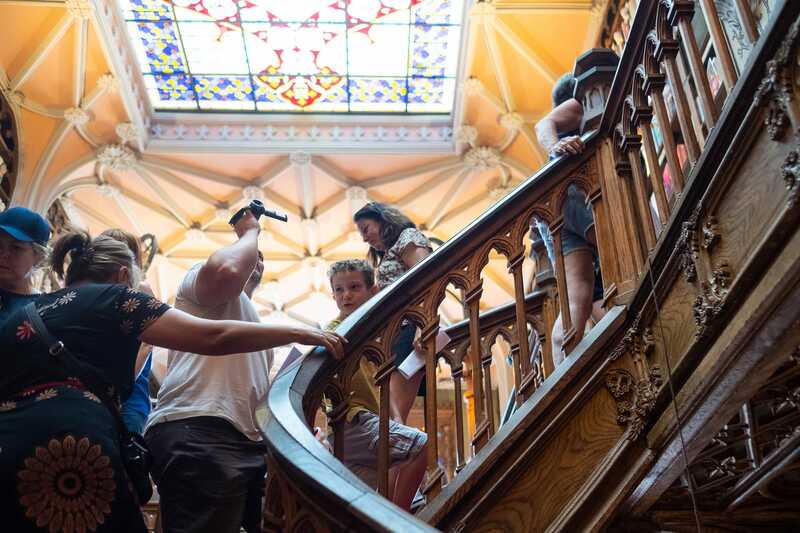 I headed back to the main staircase to have another look before heading upstairs. 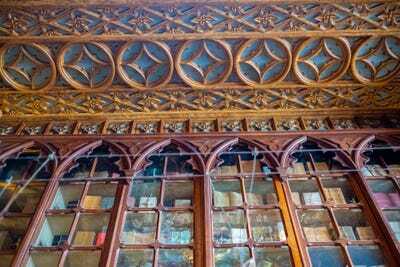 Much of the bookstore’s interiors are treated with the plaster decorated to look like wood carvings. I found it difficult to figure out what was wood and what wasn’t. The sense of being in a tourist trap does not abate as you head up the stairs. Everywhere people are conducting mini photo shoots or filming the entirety of their experience. While I’m happy that the bookstore is doing better financially thanks to the admission tickets, I felt that if you’re going to have people pay, the flow of people should be better managed. 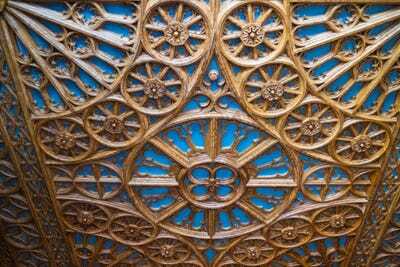 There are lots of decorative details to notice if you look closely. 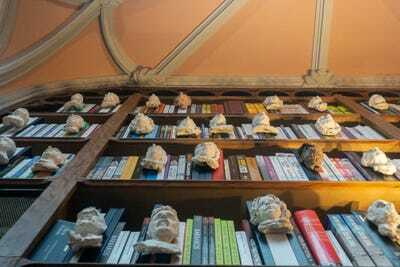 Many of the pillars in the store feature bronze bas-reliefs of Portuguese literary figures, and the floors are lined with tracks for ladders to glide along for moving books. Many have noted the similarity between Rowling’s description of the Flourish and Blotts bookstore in the “Harry Potter” books and Livraria Lello. 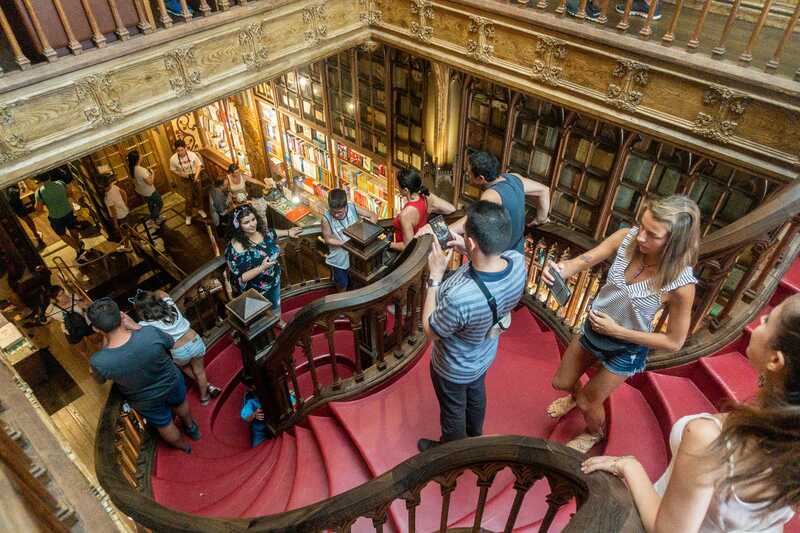 These pyramid-shaped lamps hanging from banisters added to the magical air in the bookstore. 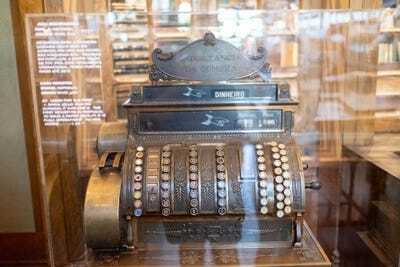 Toward the back of the second floor is the bookstore’s first cash register, made in Ohio. It was one of the first cash registers used in all of Portugal. 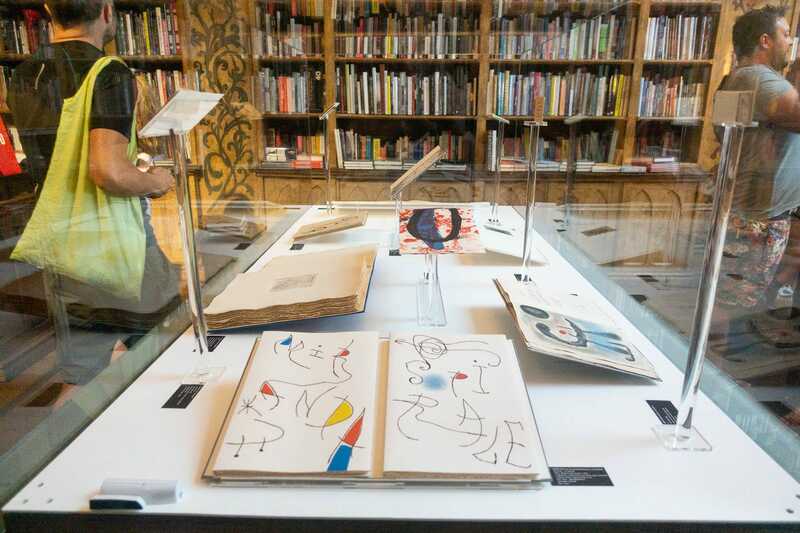 A small exhibit depicted sketches and early works of the Spanish painter Joan Miró. Here’s a second look at the stained-glass skylight, this time from the second floor. Most of the pictures I have seen on the internet of the bookstore show it as a vast open space. This a photographic trick from a wide-angle lens. It is actually pretty narrow, as one would expect of the time period. 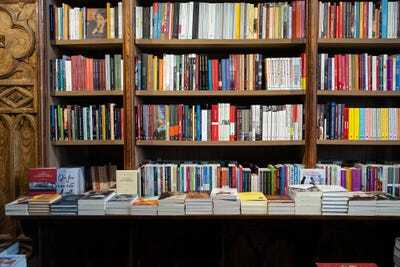 But there is no shortage of books. 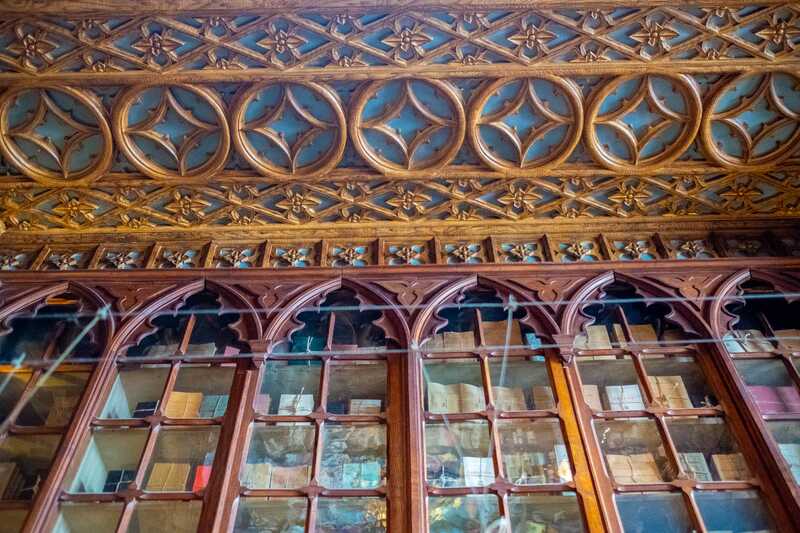 Shelves of books go from floor to ceiling. There are even books in glass cases near the top of the ceiling. I wonder whether those are just decorative or are actually books you can buy. 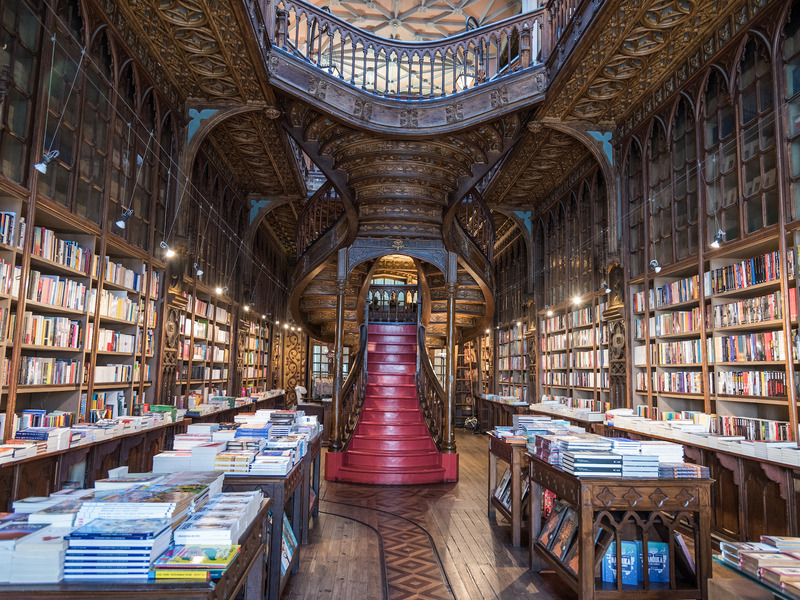 It’s easy to imagine some banned book of dangerous potions lying at the top there. 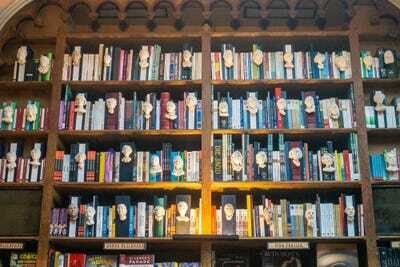 One of my favourite decorative motifs in the bookstore was the small plaster sculpted heads of authors that lined the shelves on the second floor. After about half an hour in the store, I’d had enough of dodging selfie artists. I’ve seen pictures of the bookstore during the winter and spring far emptier. I imagine it’s much nicer to visit then. 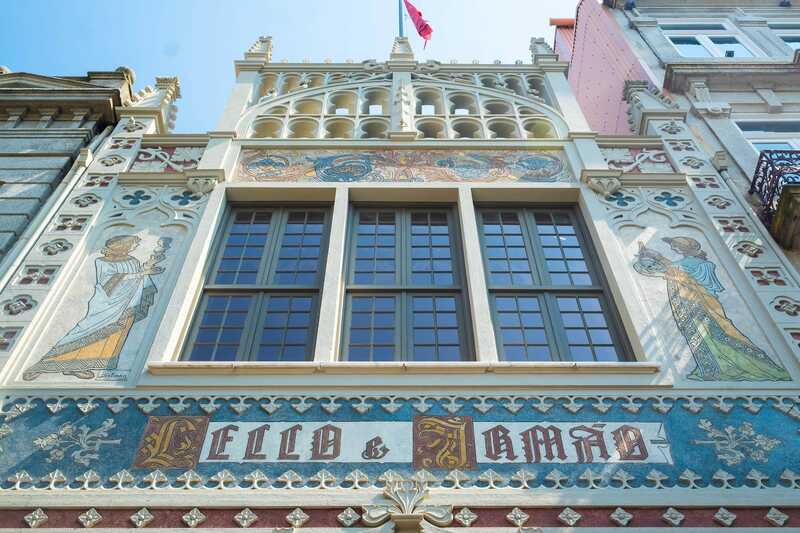 Even with all of the tourist hullabaloo, I found Livraria Lello to be worth a visit. It’s a gorgeous architectural work and certainly conjures images of J.K. Rowling’s magical world. 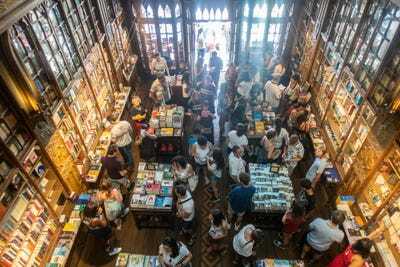 In the future, I hope the owners learn to better manage the bookstore as a tourist attraction — as that is its primary purpose these days, like it or not.